The younger brother of Admiral Andrew Cunningham, the man who effectively eliminated the Italian naval threat in the Mediterranean as early as 1940, General Alan Cunningham did virtually the same to the Italian threat in Ethiopia. Overcoming topographical and administrative obstacles, Cunningham's forces entered Italian Somaliland, occupied the ports of Chisimaio and Mogadiscio, and then pursued the Axis enemy into the Ethiopian capital, Addis Ababa. On May 20, 1941, along with General Sir William Platt, whose army was advancing on the Italian invaders from the north, Cunningham received the surrender of Amadeo di Savoia, commander of the Italian armies. The way was paved for the return of Ethiopia's emperor, Haile Selassie. Cunningham was less successful in campaigns in Libya and was finally relieved of his command. He returned to England and, in 1941, was knighted for the successes he had enjoyed. 1895 Adolf Hitler starts elementary school at Fischlham, Austria: In April of 1895 the Hitler family had moved to the hamlet of Hafeld, some thirty miles southwest of Linz, the provincial capital. Consisting of a dozen houses set on a high ridge, surrounded and half-hidden by orchards, Hafeld is a small village with a population of around one hundred. With the intention of working the land during his impending retirement, Alois, with nearly forty years in the customs service, purchases a beautiful nine-acre farm within sight of the mountains of the Salzkammergut. 1896 Birth: Herbert Backe: He will join the Nazi Party in 1931 and become head of the farmer's political organization in his district. Food Commissioner of the Four-Year Plan in 1936, he will be nominated as Richard Darre's successor in 1942 and given the responsibility for organizing the foodstuffs sector of the war against Russia. Backe will be appointed Reich Minister of Food and Agriculture and become a member of Hitler's last cabinet in April 1944. He will commit suicide by hanging himself at Nuremberg prison. A career infantry officer, Mark W. Clark was best known for his remarkable physical courage and for his controversial command of the multinational US Fifth Army in Italy from September 1943 to December 1944. A 1917 graduate of West Point, Clark was wounded on his first day of combat while serving with the Fifth Division in France in June 1918. 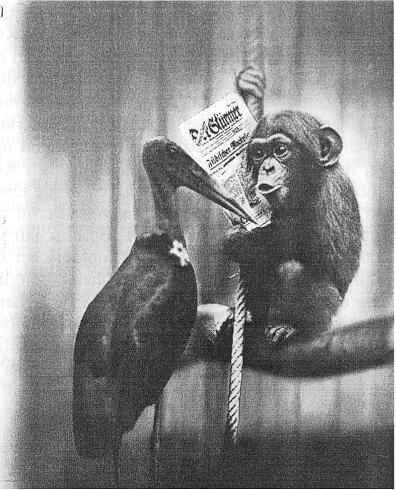 In 1942, George Marshall sent Clark to England, where he so impressed Winston Churchill that the prime minister nicknamed him "the American Eagle." Shortly thereafter he was appointed as Dwight Eisenhower's deputy supreme commander for the invasion of French North Africa. His appointment to command Fifth Army made him the youngest lieutenant general in the US Army. Despite a well-earned reputation for bravery, Clark earned considerable criticism for the Salerno landings, the ill-fated Rapido River operation in January 1944, the Battle of Anzio, a series of unsuccessful and costly assaults against the town of Monte Cassino, the destruction of the abbey of Monte Cassino by Allied bombers, and his failure to encircle the German Tenth Army during the drive on Rome. 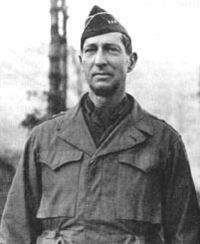 Clark ended the war in command of the Allied Fifteenth Army Group in Italy. 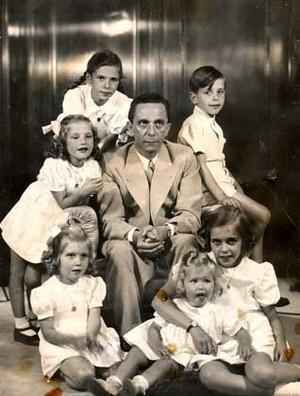 From 1945 to 1947 he was the US high commissioner in occupied Austria. 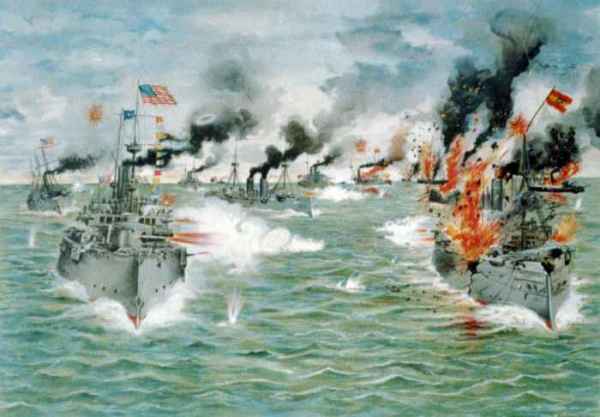 1898 Spanish-American War: The Battle of Manila Bay finds the USS Boston defending America's interests (engaging in colonialism) on a Pacific island. War at Sea: A German U-boat torpedoes the American tanker Gulflight, causing three deaths. Germany quickly offers to make reparations and promises not to attack again without warning, unless the enemy ship tries to escape. Germany refuses to abandon submarine warfare, the only maritime warfare it can successfully carry out. Lusitania leaves New York on the same day that the German Ambassador, Count von Bernstorff, publishes advertisements warning that passengers traveling on ships carrying a British flag do so at their own risk. Former President Teddy Roosevelt, writing in his magazine column after the sailing but before the sinking, declares that President Wilson should have had the German Ambassador and his staff arrested and placed on board the Lusitania, with compliments. In The Hague, Netherlands, resolutions are adopted on peace and women's suffrage. The congress, also referred to as the Women's Peace Conference, was the result of an invitation by a Dutch women's suffrage organization to women's rights activists around the world to gather in peaceful assemblage during one of the most divisive and intense international conflicts in history: World War I. It included more than 1,200 delegates from 12 countries—including Britain, Germany, Austria-Hungary, Italy, Poland, Belgium and the United States. Munich: As the men of the Freikorps enter Munich and fight their way to the center of the city, they are met with rifle fire from the List Regiment barracks. The Red Guards are easily defeated. Hitler, together with everybody else in the barracks, is arrested and imprisoned in the cellars of the Max 11 High School . On this May Day, Lenin, speaking to a crowd in Red Square, proclaims: "The working class, which has liberated itself, now celebrates its day freely and openly not only in Soviet Russia, but in Soviet Bavaria as well." 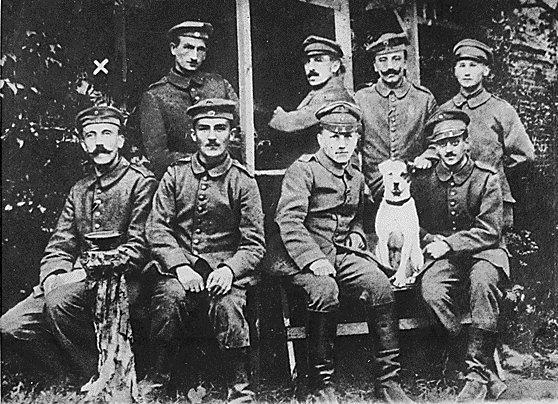 1923 Between 1200 and 2000 nationalist troops, including 1,300 SA, muster on the Oberwiesenfeld, mid-morning. Hitler is dressed in combat uniform, with a steel helmet on his head, and his Iron Cross pinned to his chest. Arms from one of Roehm's secret arsenals, to supplement those already issued, are handed out to the men, who go through the motions of military "maneuvers". Elsewhere, General Otto von Lossow, commander (Befehlshaber) of the Reichswehr in Bavaria, dresses Roehm down for arming the units, and demands that he ensure that violence does not commence. Then, shortly after eleven, a strong Reichswehr detachment swung into view, flanked right and left by the green-uniformed forces of the police. At sight of them, Hitler's face contorted with rage; his body crouched forward, as though he would spring at these men who interfered with his destiny, and whip them single-handed. For a moment I thought he was on the point of an hysterical fit, and then he saw Captain Ernst Roehm . . . .
A soft cry sounded behind Hitler's clenched teeth and he leaped toward Roehm like a maniac, seizing him by the tunic with trembling hands. "Have you betrayed us?" he screamed in a frenzy. "Explain! Why are you with these traitors? What has happened?" "Control yourself. The time is not yet ripe." The two men gazed into each other's eyes, and Hitler was the one to give way. Perhaps the ingrained military training of years, his subconscious acceptance of their corporal-and-captain relationship, had something to do with it. In a moment, his hands fell from Roehm's uniform, and Hitler dropped his eyes. He turned away . . . .
Gregor Strasser and Kriebel were all for defying the Reichswehr detachment, and making a fight of it: "They were all for firing upon the Reichswehr and starting a pitched battle, but Hitler was adamant in his surly refusal . . . . He sulked, taciturn and glowering, but he wouldn't listen to those of his leaders who favored a pitched battle." A clearly defeated Hitler nonetheless attempts to spin the event as a victory. In a short, less than inspiring impromptu address, he tells the assembled men that: "No man should hang his head if the order is given that the weapons are to be surrendered. In the city, everything is calm; the weapons are not there for the purpose of provocation. Should there, however, be confrontations, then we will manage somehow . . . . Our day will probably come soon." At about 2:00 o'clock in the afternoon, the troops return their borrowed weapons. Meanwhile, the May Day rally at the Theresienwiese, with an attendance of 25,000, had dispersed around noon without incident. It is apparent to most that Hitler has lost much prestige this day. Otto Strasser: "He could have known no more bitter humiliation, and he drank his cup of defeat to its bitter dregs." His father, a Russian immigrant who drove a bakery delivery truck, died when Heller was five. Heller attended Abraham Lincoln High School in Brooklyn and worked as a filing clerk and blacksmith's assistant before enlisting in the Army. He trained as a bombardier and flew 60 combat missions near the end of World War II. While in the military, he ran across an apparent paradox in Army regulations. A pilot could be grounded if found insane, but if the pilot requested to be grounded because of insanity, the Army considered him perfectly sane for wanting to avoid danger-and wouldn't ground him. This paradox defined his first novel, the satirical masterpiece Catch-22 (1961). Cyprus becomes a British colony having originally been annexed in 1914, when Turkey supported Germany during World War I. Without my political activity my name would be unknown, and I would be lacking materials for the publication of a political work . . . . Accordingly in my case as a political writer, the expenses of my political activity, which is the necessary condition of my professional writing as well as its assurance of financial success, cannot be regarded as subject to taxation. . . . . The Finance Office can see that out of the income from my book, for this period, only a very small fraction was expended for myself; nowhere do I possess property or other capital assets that I can call my own. I restrict of necessity my personal wants so far that I am a complete abstainer from alcohol and tobacco, take my meals in most modest restaurants, and aside from my minimal apartment rent make no expenditures that are not chargeable to my expenses as a political writer . . . . Also the automobile is for me but a means to an end. It alone makes it possible for me to accomplish my daily work. W.A. Harriman & Co: Prescott Bush joins as a vice-president, under the bank's president, George Herbert Walker, his father-in-law. 1932 Death: Paul Doumer: President of France, assassinated by Russian émigré, Paul Gargalov. 1933 Hitler holds a massive May Day celebration. 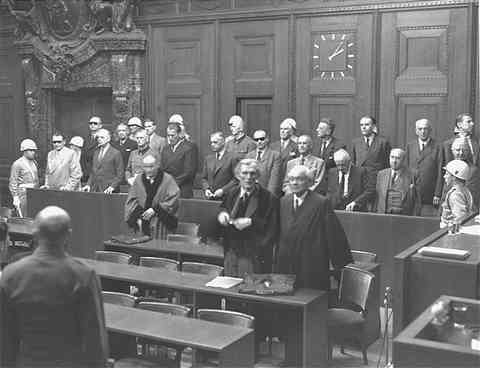 Austria: A new Austrian constitution is approved that makes all the decrees Dollfuss has already passed since March 1933 "legal." The new constitution sweeps away the last remains of democracy. Whenever the President shall find that such a state of civil strife exists in a foreign state and that such civil strife is of a magnitude or is being conducted under such conditions that the export of arms, ammunition, or implements of war from the United States to such foreign state would threaten or endanger the peace of the United States, the President shall proclaim such fact, and it shall thereafter be unlawful to export, or attempt to export, or cause to be exported, arms, ammunition, or implements of war from any place in the United States to such foreign state, or to any neutral state for transshipment to, or for use of, such foreign state . . . .
Austria: Hitler's Germany is outraged when an Austrian official in the small hamlet of Pinkafeld hauls down a flag of the German Reich. There was great excitement in the press; I instantly tried to settle the matter amicably with the Austrian Minister for Foreign Affairs. Thereupon I received a telegram to proceed to Berlin at once. I arrived in Berlin and reported to Hitler. Hitler did not receive me. I waited for 3 days. After 3 days, I wrote and told him, "It appears that you are trying to use the flag incident at Pinkafeld to introduce an aggressive policy against Austria. In that case there is nothing more for me to do, and I beg to hand in my resignation." A quarter of an hour later he called me to the Reich Chancellery. He gave me a lecture, which lasted half an hour, furious and beside himself with rage over the humiliations which the German Reich could no longer tolerate. After his rage had spent itself I told him that our agreement of 26 June ruled that the policy concerning Austria was to be conducted on evolutionary lines. The Agreement of 11 July emphasized that. "If you wish to pursue a different policy, then dismiss me," I said. As a result of this very serious conversation he said, "No, no. Go back and settle everything; we do not want to change our peaceful policy." I returned to Vienna, and the incident was settled satisfactorily with the Austrian Minister for Foreign Affairs within 24 hours. The Pinkafeld flag incident is an example of von Papen's activity as mediator. In itself it was a minor incident, but it led to threats of invasion by Hitler. Von Papen was called to Berlin and had a great deal of difficulty in calming down Hitler's fury, who, as I said, threatened to invade Austria. He succeeded in settling the matter and there were no consequences. It was officially demanded that I join the National Socialist Party. 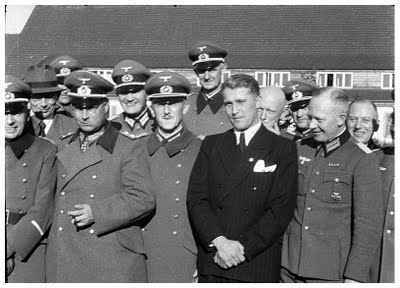 At this time (1937) I was already technical director of the Army Rocket Center at Peenemunde . . . . My refusal to join the party would have meant that I would have to abandon the work of my life. Therefore, I decided to join. My membership in the party did not involve any political activities . 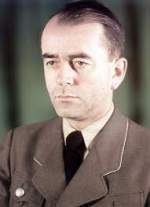 . . in Spring 1940, one SS-Standartenfuehrer (SS Colonel) Mueller . . . looked me up in my office at Peenemunde and told me that Reichsfuehrer-SS Heinrich Himmler had sent him with the order to urge me to join the SS. I called immediately on my military superior . 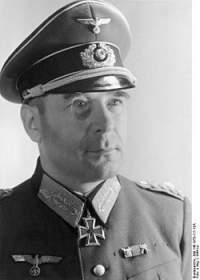 . . Major-General W. Dornberger. He informed me that . . . f I wanted to continue our mutual work, I had no alternative but to join. Holocaust: The Lodz ghetto, containing 160,000 Jews, is sealed off from the outside world. The 1940 Summer Olympics are canceled: The Games were retracted from Tokyo by the IOC, owing to the outbreak of the Second Sino-Japanese War in 1937. They were awarded to the runner-up Helsinki, Finland, and were scheduled to be celebrated between July 20 and August 4, 1940. When World War II broke out, the Summer Games were canceled indefinitely, resuming in London in 1948. North Africa: German forces launch a major attack on Tobruk. Note: Tobruk is strategically important to the conquest of Eastern Libya. Crete: Operation Mercury launched by German forces—the largest airborne invasion to date—in their bid to capture the island. Tito's regular forces are now fighting in Trieste, and have already occupied most of Istria. I am quite certain that he will not withdraw his troops if ordered to do so unless the Russians tell him to. If I am ordered by the Combined Chiefs of Staff to occupy the whole of Venezia Giulia by force if necessary, we shall certainly be committed to a fight with the Yugoslav Army, who will have at least the moral backing of the Russians. Before we are committed I think it as well to consider the feelings on our own troops in this matter. They have a profound admiration for Tito's Partisan Army and a great sympathy for them in their struggle for freedom. We must be very careful therefore before we ask them to turn away from the common enemy to fight an Ally. Of course I should not presume to gauge the reaction of our people at home, whom you know so well. It has been reported from the Fuehrer's headquarters that our Fuehrer Adolf Hitler has died this afternoon in his battle headquarters at the Reich Chancellery, fallen for Germany, fighting to the last breath against Bolshevism. On the 30th of April the Fuehrer nominated Grossadmiral Doenitz to be his successor. 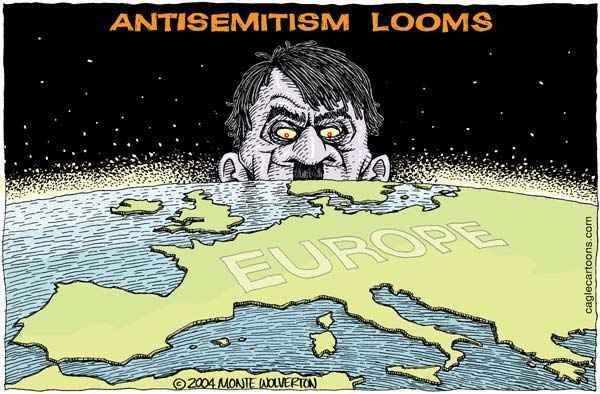 The Grossadmiral and Fuehrer's successor will speak to the German nation." Doenitz: "German men and women, soldiers of the German Armed Forces. Our Fuehrer Adolf Hitler is dead. The German people bow in deepest sorrow and respect. Early he had recognized the terrible danger of Bolshevism and had dedicated his life to the fight against it. His fight having ended, he died a hero's death in the capital of the German Reich, after having led an unmistakably straight and steady life. Bormann made sure that the news of Hitler's death was not broadcast until he had made one last desperate attempt to achieve supreme power for himself. 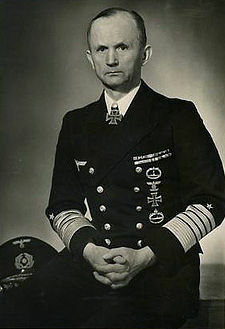 First he attempted to manipulate and control Admiral Doenitz, who was still at liberty in northern Germany. Bormann informed Doenitz that he would soon join him in Flensburg. This never occurred . . . . When Hitler's death was announced, it was done in the true spirit of National Socialism; false heroism and blatant lies. The slow movement of Bruckner's Eighth Symphony was played, along with Siegfried's 'Funeral Music' by Wagner. Then it was announced that 'Adolf Hitler has fallen at his command post in Berlin after fighting with his last breath against the Bolsheviks.' This was consistent with Nazi rhetoric, for in April Nazi and SS officials had scrawled all over the walls of beleaguered Berlin: 'Berlin remains German.' 'Our walls are broken but not our hearts,' 'SS believes in the Fuehrer.' If Hitler had indeed committed suicide and had not fought the Russians to the very end, it might appear as if he had irresponsibly and pusillanimously tricked and betrayed the millions who had taken an oath of allegiance to him in one form or another. General Krebs [above] meets with Zhukov—but returns empty handed after refusing to agree to an unconditional surrender. Note: Only Reichskanzler Goebbels now has the authority to agree to an unconditional surrender. It was only just after 5 PM when Frau Goebbels walked past me followed by the children. They were all wearing white nightgowns. She took them next door. An orderly arrived carrying a tray with six cups and a jug of chocolate. Later somebody said it was laced with sleeping pills. I saw her hug some, stroke others as they drank it. I don't think they knew about their Uncle Adolf's death; they laughed and chatted as always. A little later they passed me on their way upstairs, Heidi last, her mother holding her hand. Heidi turned around. I waved to her, she waved back with one hand, and the suddenly, letting go of her mother's hand, she turned all the way around and, bursting into that happy clear laugh of hers, she scraped one forefinger along the other and chanted that little rhyme she always sang when she saw me: 'Misch, Misch, you are a fish.' (Misch, Misch, Du bist ein Fisch.) Her mother put her arm around her and pulled her gently up the steps, but she went on chanting it. I still hear it now. Reich Propaganda Minister Josef Goebbels writes his political testament, as an appendix to Hitler's. The Fuehrer had ordered me to leave Berlin . . . and take part as a leading member in the government appointed by him. For the first time in my life, I must categorically refuse to obey an order of the Fuehrer. My wife and children join me in this refusal. Apart from the fact that feelings of humanity and personal loyalty forbid us to abandon the Fuehrer in his hour of greatest need, I would otherwise appear for the rest of my life as a dishonorable traitor and a common scoundrel and would lose my self-respect as well as the respect of my fellow citizens . . . . In the nightmare of treason which surrounds the Fuehrer in these most critical days of the war, there must be someone at least who will stay with him unconditionally until death . . . . I believe I am thereby doing the best service to the future of the German people. In the hard times to come, examples will be more important than men . . . . For this reason, together with my wife, and on behalf of my children, who are too young to be able to speak for themselves and who, if they were old enough, would unreservedly agree with this decision, I express my unalterable resolution not to leave the Reich capital, even if it falls, but rather, at the side of the Fuehrer, to end a life that for me personally will have no further value if I cannot spend it at the service of the Fuehrer and at his side. The Fuehrer died yesterday, 1530 hours. In his will dated April 29 he appoints you as President of the Reich, Goebbels as Reich Chancellor, Bormann as Party Minister, Seyss-Inquart as Foreign Minister. The will, by order of the Fuehrer, is being sent to you and to Field Marshal Schoerner and out of Berlin for safe custody. Bormann will try to reach you today to explain the situation. Form and timing of announcement to the Armed Forces and the public is left to your discretion. Acknowledge. This radio message first of all contradicted the earlier radio message which clearly stated: "You can at once do everything you consider to be right." I did not and as a matter of principle never would adhere to this second radio message, for if I am to take responsibility, then no conditions must be imposed on me. Thirdly, under no circumstances would I have agreed to working with the people mentioned, with the exception of Seyss-Inquart. In the early morning of 1 May I had already had a discussion with the Minister of Finance, Count Schwerin von Krosigk, and had asked him to take over the business of government, insofar as we could still talk about that. I had done this because in a chance discussion, which had taken place several days before, I had seen that we held much the same view, the view that the German people belonged to the Christian West, that the basis of future conditions of life is the absolute legal security of the individual and of private property. ...the legitimate successor would have been the Reich Marshal; but through a regrettable misunderstanding a few days before his appointment, he was no longer in the game, and I was the next senior officer in command of an independent branch of the Wehrmacht. I believe that was the determining factor. That fact that the Fuehrer had confidence in me may also have had something to do with it. 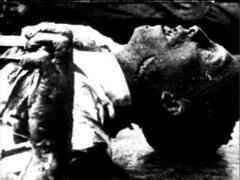 Joseph and Magda Goebbels commit suicide—mere feet away from the partially burned and buried body of their Fuehrer. 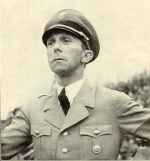 At 8:15 PM Goebbels informed the SS guards that he and his wife intended to commit suicide out of the bunker in the open air. At least, he joked blackly, it would save the guards the trouble of having to carry the bodies upstairs. He put on his hat, scarf, long greatcoat and kid gloves, then offered his arm to his wife. Together they mounted the stairs to the bunker entrance. They planned to die in the same way as the Fuehrer; both had cyanide capsules, and Goebbels carried a Walther P-38 revolver. They stood together. Magda bit her capsule and slid to the floor. Her husband delivered the coup de grace, shooting her in the back of the head. Then he bit his own capsule, pressed the Walther's muzzle to his temple and fired. The SS guards doused the bodies with petrol and set fire to them. They burned through the night, but were only partially destroyed—there had not been enough petrol left to do the job properly. As soon as the bodies were alight, the escape parties gathered their things and rushed for the exit, in a mad scramble led by Bormann. Soon, there were only three people left, Krebs, Burgdorf and the commander of the SS bodyguard, Hauptstrumfuehrer Schedle. They had all decided to shoot themselves. Those who left met with mixed fortunes. A few, including the three secretaries, managed to make their way safely to the West. Some were captured by the Soviets, and spent years in harsh captivity. Most were killed, including Bormann, who only got as far as the Lehrter rail station on Invalidenstasse before he and his companion, Dr Stumpfegger, came under fire and ended their lives with cyanide capsules to avoid being captured. Their bodies were buried under the rubble and were not discovered and identified until many years later. The Fuehrer has nominated me as his successor. In full consciousness of my responsibilities I therefore assume the leadership of the German people at this fateful hour. My first task is to save German men and women from destruction by the advancing Bolshevist enemy. It is to serve this purpose alone that the military struggle continues. For as long as the British and the Americans continue to impede the accomplishments of this task, we must also continue to fight and defend ourselves against them. The British and the Americans in that case will not be fighting in the interests of their own peoples, but solely for the expansion of Bolshevism in Europe. Only after 1 May 1945 did Doenitz try to act with reason, but it was too late . . . . There is one loyalty which everyone must always keep; and that is loyalty toward one's own people. That duty comes before everything. If I am in a leading position and if I see that the interests of the nation are acted against in such a way, then I too must act. That Hitler had broken faith with the nation must have been clear to every intelligent member of his entourage, certainly at the latest in January or February 1945. Hitler had once been given his mission by the people; he had no right to gamble away the destiny of the people with his own. Therefore I fulfilled my natural duty as a German. I did not succeed in everything, but I am glad today that by my work I was able to render one more service to the workers in Germany and the occupied territories. Mass breakout from the Fuehrerbunker—Erich Kempka, Traudl Junge, Gerda Christian, Constanze Manzialy, Else Krueger, Otto Guensche, Johann Rattenhuber, Werner Naumann, Wilhelm Mohnke, Hans-Erich Voss, Ludwig Stumpfegger, Martin Bormann [above], Artur Axmann, Walther Hewel, Guenther Schwaegermann, and Armin D. Lehmann flee for their lives. 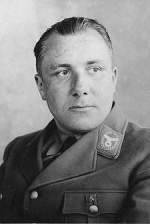 Bormann will never be seen alive again as he was shot by the Russians while attempting to flee besieged Berlin. Rumors of his survival will flourish after the war, and a number of sightings will be reported as recently as the mid 1990's. Hitler knew how to gather around him all bad elements, within the Party and its organization, and to chain tightly all those elements to himself, because he understood how to exploit shrewdly any mistake, slip-up, or misdemeanor on their part. Yesterday I talked about drunkenness as a constituent part of Nazi ideology; I did not do that with the purpose of degrading anyone personally. I did it for another quite definite reason. Yesterday Schacht was on the stand all day. He is an old hypocrite—a typical banker, full of righteous phrases and evil designs and working both sides of the street. The Justice held him to a fairly direct line of testimony, but it is difficult to do much when the court is so weak. Today Schacht was on the stand all day—he will finish his direct testimony tomorrow. 1948 Cold War: The People's Democratic Republic of Korea (North Korea) is proclaimed. 1960 Cold War: The Soviet Union shoots down an American U-2 reconnaissance plane near Sverdlovsk and captures its pilot, Francis Gary Powers. 2000 Holocaust: The Iranian embassy in Vienna grants refuge to Holocaust denier Wolfgang Frohlich.